Context: Polycystic ovary syndrome (PCOS) is the commonest endocrine disorder affecting young women. Kisspeptins are a family of closely related peptides encoded by Kiss1 gene that controls the hypothalamic–pituitary–gonadal axis by binding to its receptor (GPR54) expressed in gonadotropin-releasing hormone (GnRH) neurons and releases GnRH. Since GnRH secretion is deregulated in PCOS, we hypothesized that dysregulated gonadotropin secretion in PCOS is reflected by kisspeptin levels. Aim: We aimed to measure serum kisspeptin levels of subjects with well-characterized PCOS versus controls and explore any correlation between kisspeptin and PCOS-related reproductive and metabolic disturbances. 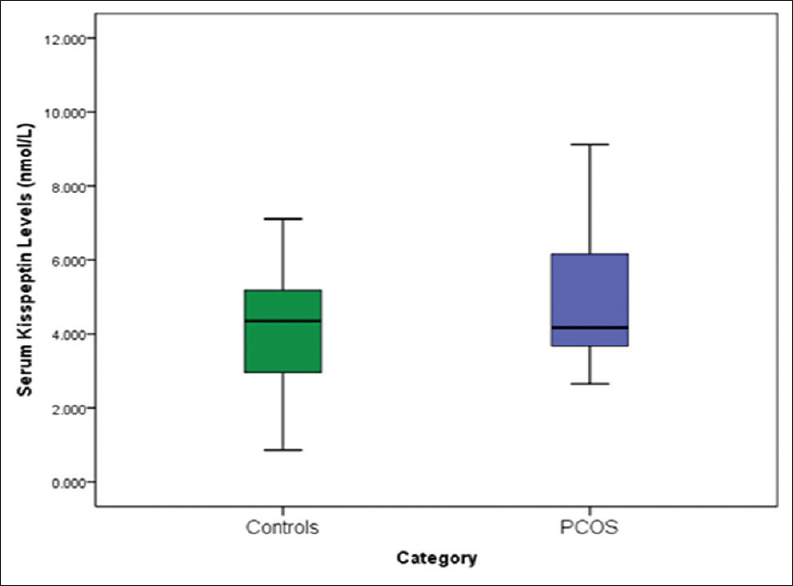 Materials and Methods: Consecutive women with PCOS manifesting from adolescence (n = 55) and adult controls (n = 110) were recruited. Pre-treatment baseline clinical, anthropometry, and biochemical parameters were measured in all. Serum kisspeptin and testosterone levels were determined by enzyme-linked immunosorbent assay method. Results: Serum kisspeptin and testosterone concentrations were significantly higher in women with PCOS (kisspeptin 4.873 nmol/L; testosterone 4.713 nmol/L) than controls (kisspeptin 4.127 nmol/L; testosterone 3.415 nmol/L; P < 0.05). Serum kisspeptin levels were positively associated with PCOS (odds ratio: 1.853; 95% confidence interval: 1.246–2.755; P = 0.002) in our studied population. Conclusion: Serum kisspeptin levels are higher in Sri Lankan women with PCOS manifesting from adolescence compared with controls regardless of body mass index. We propose serum kisspeptin concentration as a useful marker to recognize PCOS that manifests from adolescence. Introduction: Operative duration is an important but under-studied predictor of mortality in emergency laparotomies. Aims and Objectives: The primary objective of this study was to quantify the effect of duration of emergency laparotomy in children on mortality; and to identify a rough cut-off duration of laparotomy to serve as a guide so that a laparotomy can be planned to optimize pediatric surgical patient outcome. Materials and Methods: This is a prospective study conducted in a government tertiary teaching institution over a period of 24 months. All children in the age group of 5–10 years presenting in the emergency department with Pediatric Risk of Mortality III score ≤8, undergoing emergency laparotomy in emergency operation theater, were included. Observations and Results: In all, 213 children were included in the study. The mean time from presentation to shifting to the operating room was 3.7 h. The mean operative duration was 108 min. The mean operative time in survived patients was 102 min as compared to 135 min in expired patients (P < 0.05). 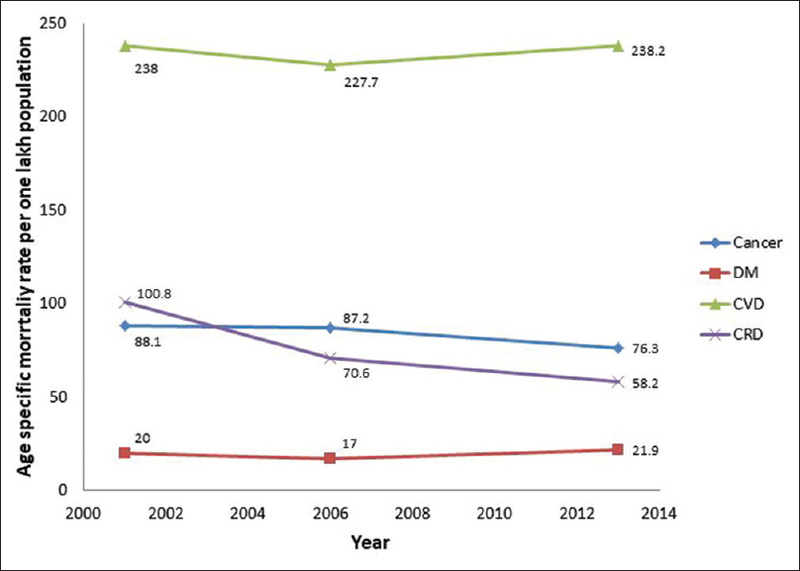 The 30-day in-hospital mortality rate was 17.4%. After application of binary logistic regression analysis, it was found that time to laparotomy and operative duration were significant risk factors (<0.05) predicting post-operative mortality. Kaplan–Meier survival curve showed a decrease at a mean weighted operative duration of approximately 100 min. Receiver operating characteristic curve analysis yielded operative duration of 123.5 min at which Youden's index maximized. 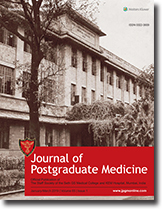 Conclusion: This 100-min duration of laparotomy might appear a long duration but in casualty setup of a government hospital with limited resources, there are so many hurdles for optimal working that completion of an emergency laparotomy in children in 100 min can be considered a realistic target for improving post-operative outcome. At an operative duration of <123.50 min, mortality rates within acceptable limits can be achieved. 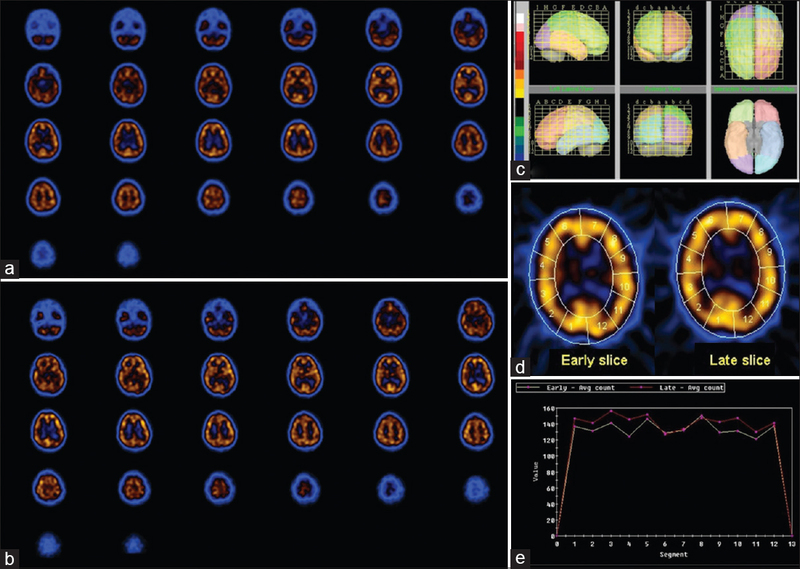 Background and Objectives: Brain single-photon emission computed tomography (SPECT) assesses brain function through measurement of regional cerebral blood flow. 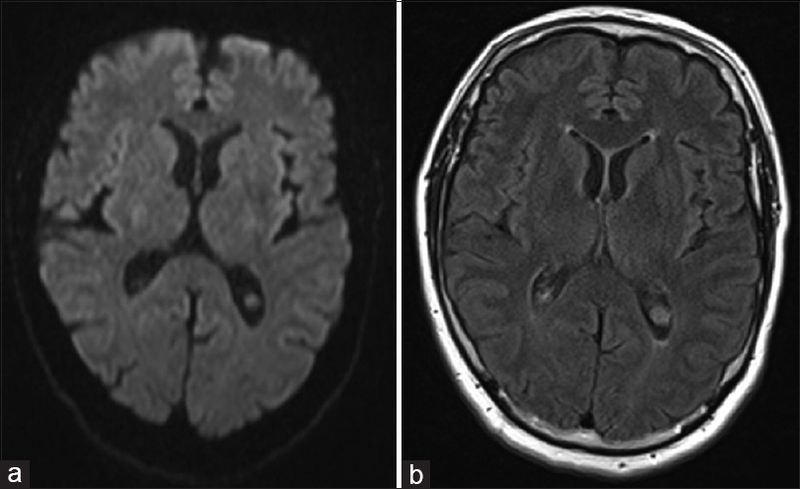 This study was conducted to assess whether students with newly diagnosed specific learning disability (SpLD) show any abnormalities in cerebral cortex perfusion. Settings and Design: Cross-sectional single-arm pilot study in two tertiary care hospitals. Subjects and Methods: Nine students with SpLD were enrolled. Brain SPECT scan was done twice in each student. For the first or “baseline" scan, the student was first made to sit with eyes open in a quiet, dimly lit room for a period of 30–40 min and then injected intravenously with 20 mCi of 99mTc-ECD. An hour later, “baseline scan" was conducted. After a minimum gap of 4 days, a second or “test scan" was conducted, wherein the student performed an age-appropriate curriculum-based test for a period of 30–40 min to activate the areas in central nervous system related to learning before being injected with 20 mCi of 99mTc-ECD. 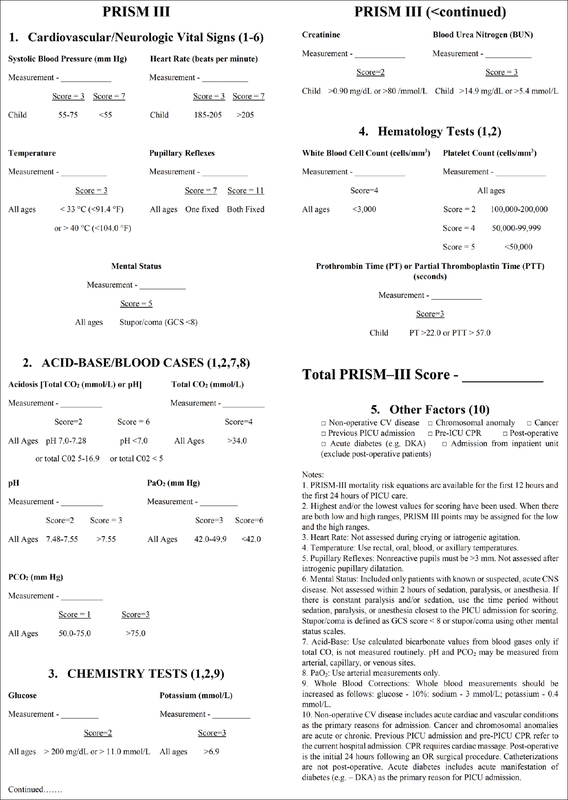 Statistical Analysis Used: Cerebral cortex perfusion at rest and after activation in each student was compared qualitatively by visual analysis and quantitatively using NeuroGam™ software. Results: Visual analysis showed reduction in regional blood flow in temporoparietal areas in both “baseline" and “test" scans. However, when normalization was attempted and comparison done by Talairach analysis using NeuroGam software, no statistically significant change in regional perfusion in temporoparietal areas was appreciated. Conclusion: Brain SPECT scan may serve as a robust tool to identify changes in regional brain perfusion in students with SpLD. There have been various cases of salmonella osteomyelitis reported in sickle cell anemia. 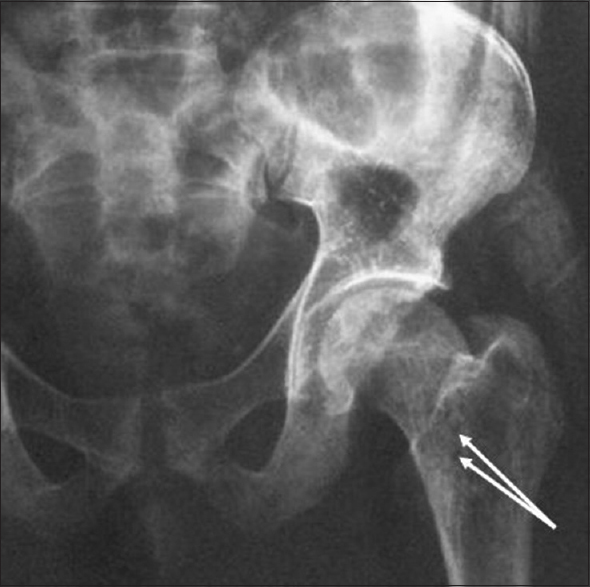 We present a case of emphysematous osteomyelitis caused by Salmonella typhi in a 29-year-old beta thalassemia major patient. 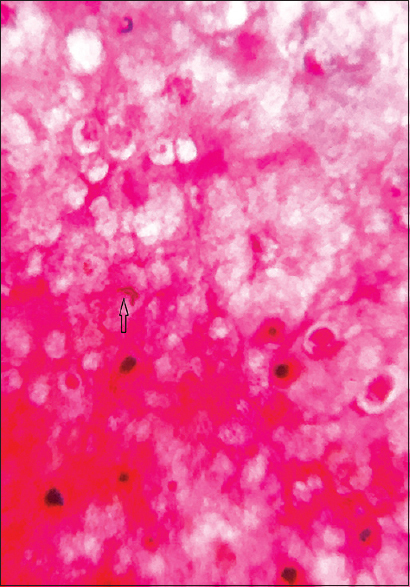 Diagnosis of emphysematous osteomyelitis was confirmed by computed tomography and magnetic resonance imaging, and culture of pus drained during surgical debridement confirmed the causative microorganism, Salmonella typhi. Antimicrobials were given according to microbiological sensitivity for a period of 8 weeks. Our patient also received hyperbaric oxygen therapy. At the end of therapy, he was afebrile and laboratory parameters normalized with a residual joint deformity which developed within 3 months. 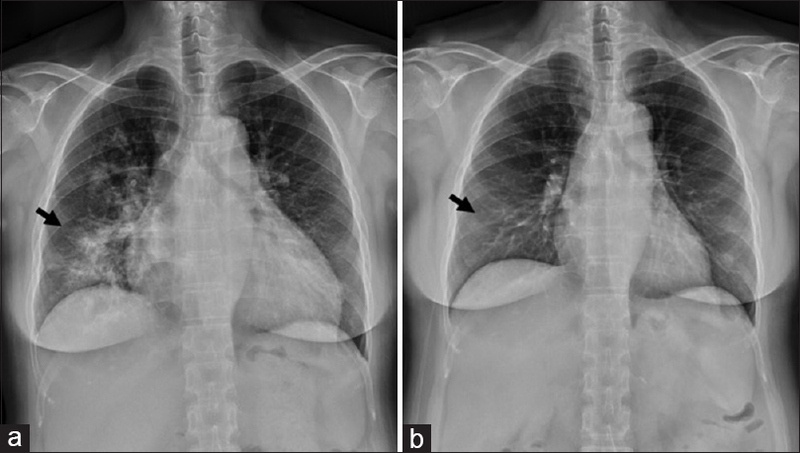 We report a 49-year-old woman who presented with a hypertensive crisis and acute heart failure and reduced left ventricular systolic function. 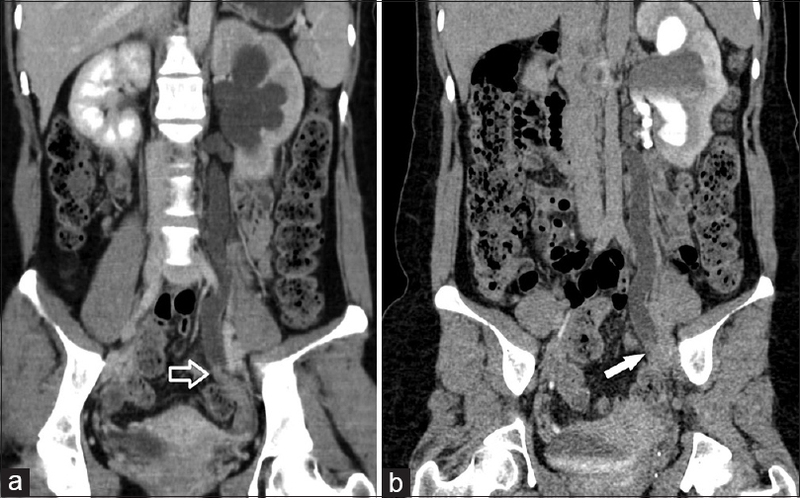 An abdominal ultrasonography revealed a huge lobulated heterogeneous mass at the lower pole of the right kidney and a mass over the left suprarenal area, which were further delineated by magnetic resonance imaging. 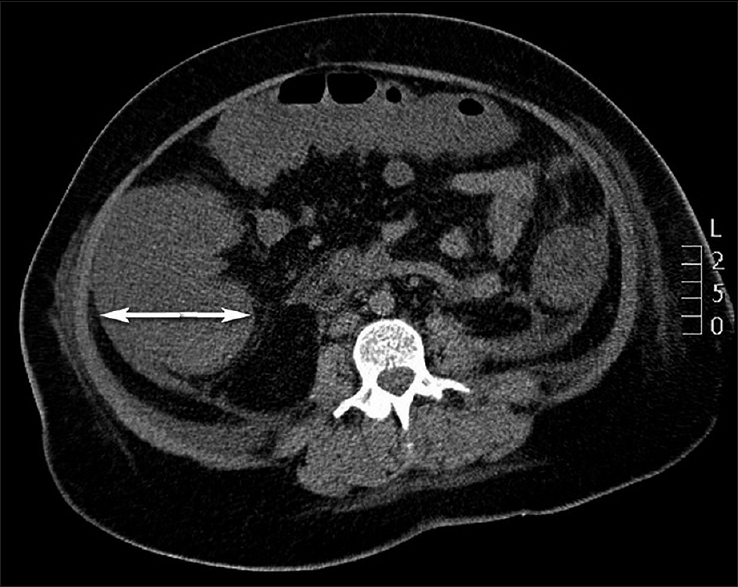 The patient underwent laparoscopic right radical nephrectomy and left adrenalectomy. 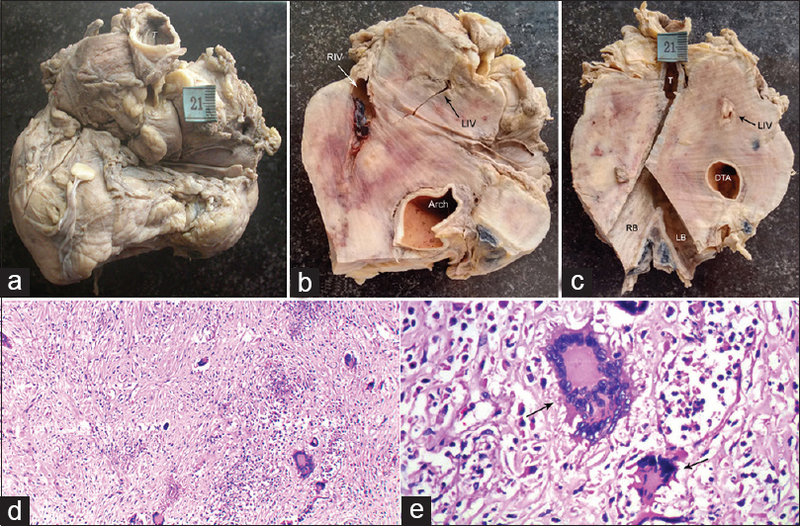 Histopathological analysis confirmed the diagnoses of clear cell renal cell carcinoma of the right kidney with metastasis to the lung; and atypical pheochromocytoma of the left adrenal gland. Target therapy was initiated, which resulted in stabilization of the patient's tumors and the recovery of her heart function. To avoid a delayed diagnosis and catastrophic outcome, clinicians should consider such rare causes of acute decompensated heart failure.